Yesterday, I went to a 70%-OFF-WE’RE-CLOSING-GET-DEAD-TREES-NOW Borders location. It was big bold letters on Day-Glo yellow and Blood-Spatter red, empty shelves and fixture sales. You know you’re in trouble when you have to sell the shelves as well as the books. The books were all shelved like authors would ideally hope: each book with its own spot, title and author proudly (?) displayed. Islands of misfit books, the remnants and remainders and left-behinds. Three sections of romance bleeding over into science fiction and fantasy (which, let’s be honest, isn’t far from the truth sometimes). Lots of young adult, following previous publishing trends, and lots of titles and authors that make me feel a little less bad for Borders in the first place because it makes me think that when they’re publishing that, they’re asking for it: Twilight, Going Rogue, Glenn Beck. And even despite the 70% off, even despite new titles steeply discounted, I browsed and, when I saw something interesting, thought, yeah, I’d pay seven bucks for this hardcover, or I could go home, pay the same-ish, and have it on my Kindle. I left with four books (I paid 75 cents for Wolfe’s The Right Stuff. 70% off a Bargain price. Not like Wolfe would have seen any money from either sale anyway) and a couple of DVDs and an extended-cut Bluray of Taken. I paid $40 and wondered whether any authors would see any of that money or it would go straight to Borders executives before it went to corporations. I don’t know how many stores Borders is closing, but I have a feeling it won’t stop. It’ll be a slow process to start with, but then, at some point, when it’d be silly not to, I think Barnes & Noble will buy the entire operation for pennies on the dollar, at which point there will be one large chain with more than 1000 stores and then a few regional chains and then a few independent chains and then independent stores. Plus Costco and Walmart and Target. I was looking at numbers for the retail publishing industry. Books-A-Million has something like 200 branches throughout the south, and then the next-largest chains are Hastings (with 149 stores). And then Hudson, which is more newsstands in northern New Jersey, and then Book Rack and Powell’s, and then a Michigan-based store. There are some independent chains, which I think means it’s owned by one person who’s not so beholden to shareholders. I think about all this because I think about how everything’s changing a lot. I think all writers should be. I think all writers should know what’s going on. Many don’t want to. Many would rather “just write” and leave all the business thinking to agents and editors and publishers. The idea that agents and editors and publishers are what got us to 70%-OFF bookstore closings with crime-scene colors is topic for other discussion. Because one has to wonder: where is it going? What’s going to become of reading and literacy? Within ten years (and probably sooner), we’re going to see the death of big bookstores (like Borders and Books-A-Million). In terms of corporate retail, we’ll see books in the usual places–Target, Walmart, Costco–and mainly big names, movie tie-ins, or books with a huge amount of buzz (Franzen, Gruen, etc.). Independent bookstores will gain some traction, but not a whole lot, because opening an indie bookstore is daunting. Barnes & Noble will focus on the nook line, which will become more their version of the iPad than their version of the Kindle (it already almost is). B&N, Amazon, and Apple will become the digital equivalent of B&N, Borders, and B-a-M.
More people will read on screens, be they phones, computers, or e-readers. There is already some division between readers: in general, and broadly, there are two types–those who read fewer than ten books per year, and those who read more. Those who read more are the ones most likely to invest in a digital reader. Those who read fewer are more likely to get their books from Target or while grocery shopping. Where will this leave corporate publishers? I have absolutely no idea. I don’t know where they think they’re going to sell books, now that Borders and B-a-M are basically gone and B&N is concentrating on nook. What’s worse is the uncertainty; it takes forever to publish a book. From first submission to final publication, in general, it’s–charitably–a five-year timeline (including lots of rejection and revision), and that’s if you’re good and ever get beyond submission. Finally, Kindle will dominate e-readers. iPads, nooks, and Sony readers will compete and share the market, but for the most part, iPads and nooks will become more akin to tablet computers on which one happens to be able to buy books. That’s if Kindle stays on track as it has, with e-ink screens (even if hybrid) and pricing. When you consider that the original Kindle cost nearly as much as an iPad but that it now costs less than $150 in just a few years, I think that’s pretty remarkable. I think it’s going to continue to drop in terms of price, and I wouldn’t be surprised if we saw the first sub-$100 Kindle later this year. In fact, I made this very prediction elsewhere, on Facebook, five days before Amazon announced the new $114 ad-subsidized model. 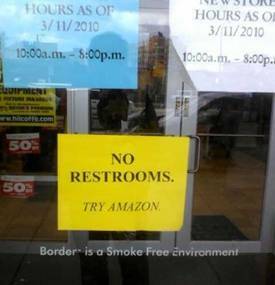 Borders’ bitterness (if the sign is to be taken at face value) toward Amazon is arguably understandable but ill-founded. It makes a good Internet meme, certainly, and it was all over Twitter and even hit BoingBoing, but it belies greater discussion. It’s a good joke that Borders would be bitter. It’s less of a joke than that the current book retailing climate seems to be tipping, and that its previous set up is what is bringing it inexorably down. This is how business and commerce work, especially with regard to media, which changes constantly; Borders is merely going the way of Blockbuster and Tower, mainly because bookselling sometimes concentrates more on the books and less on the service. It’s amusing to think of Borders as being bitter toward Amazon. But really, the plain fact is that one doesn’t need to leave the bathroom in one’s own home to shop at Amazon. Which is nice. Silly Borders: we go to Amazon for books (and electronics, and Kindles, and everything A to Z); we went to Borders for coffee. Sometimes. We went to browse magazines and skim books we just put back on the racks and then bought later, on Amazon, for less. The stories haven’t gone anywhere, and they won’t. It’s just the delivery of stories that will change. As I write this, Borders is closing stores while Barnes & Noble shifts to focus on nook and nook color, which might make sense, because as I wrote this, the Amazon Kindle surpassed 800,000 fans on Facebook. People seem to love their Kindles as much as they’ve loved their favorite books (although the same might be said for the iPad, though in a different way, considering the iPad’s lack of dedication). Yesterday was the first time in months I’d visited a bookstore at all. But since the beginning of January, I’ve spent several hundred dollars on books, none of which have been used. Already, this year, I’ve spent more on books than in several years before. I’m reading more, and more widely. I don’t think I’m alone. Before my Kindle I got books from the library. Since my Kindle (almost a year) everything I’ve read (about 30 books), I bought. In less than a year I’ve spent more on e-books than I spent on books in several years combined. I love my Kindle. L.O.V.E. With that said – pre-purchase, I struggled with it. I have shelves and shelves of books that started back from when I was a kid. Books that I hope my kids will enjoy one day. But, by then … will they have Kindles too? Will it be part of the curriculum at schools to cut cost? That’s been exactly my experience, Nina. And I get what you’re saying, Wicked, but I don’t think it’s binary. I have a Kindle, now, and read almost exclusively on it, but “exclusively” is an important word, there. I built my own book shelves as a showcase for my favorite books, because that’s how much I love them. As for how reading will evolve, and whether our children will have Kindles . . . I think that depends on screen technology. Until e-ink can do color, I don’t think so, but as soon as it does–can you imagine a Dr. Seuss edition Kindle, preloaded will all those books, in full color? For, say, $50? One day, stuff like that’s going to be common. I will admit I never quite understood the “fresh book smell” thing, though. That may just be me. It’s certainly not just you. I’ve heard lots of people mention it. As both you and Nina have said, I read and buy more now that I have a Kindle. Great article. I’ve been thinking a lot about this topic lately. I’m being more open-minded and willing to be honest about the changes occurring and what this means for us as writers. I was in a Toys R Us a few weeks ago with my mum, looking for birthday gifts for a three year old. Leap Frog and a bunch of the children’s toys companies already have “e-readers” for kids. For kids as young as two and three, I might add. They were a little more interactive video game than e-ink serious reader, but the point is that toddlers are now getting introduced to the concept of books on a screen. I found that fascinating. The readers, themselves, weren’t that expensive compared to their adult counterparts (I think the reader was about $50-60). The books were more expensive, though, each being about $20. The real idea behind them that I was interested in, though, was whether these kids growing up with these devices were more likely to automatically reach for a paper book or an ebook when they’re old enough for such things. I’m betting the majority will feel comfortable reaching for the ebooks.